Your First Month is Free! Thank You for Watching Our Video! ABCmouse.com Early Learning Academy’s pre-kindergarten (pre-k) curriculum is designed to help you ensure that your child is very well prepared for kindergarten, whether he or she is currently enrolled in a preschool or pre-k program, or learning at home. Our pre-k curriculum offers more than 1,000 exciting and engaging learning activities in the four core curriculum areas of Reading, Math, World Around Us (beginning science and social studies), as well as Art & Colors. Get Your First Month FREE! ABCmouse.com’s pre-k art curriculum teaches children to name and identify 11 different colors (red, yellow, blue, green, orange, purple, black, brown, white, gray, and pink) as well as to recognize them in their day-to-day lives. Children also learn to recognize and use several basic shapes in drawing and coloring. Our online pre-k art curriculum includes many opportunities for children to create their own visual art pieces, using the site’s multifeatured drawing and painting program or any of more than one thousand printables. 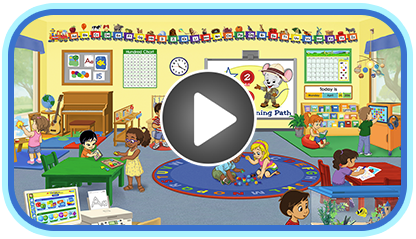 ABCmouse.com’s comprehensive curriculum has been designed in close collaboration with nationally recognized early childhood education experts, ensuring that the content aligns with best practices of early education. And with no advertising and no links to other websites, ABCmouse.com provides a completely child-safe resource. Families use ABCmouse.com to help young children to prepare for and be successful in preschool, pre-k, and kindergarten classes. Visit our homepage to learn how ABCmouse.com’s Step-by-Step Learning Path makes it easy to help children enter school with confidence. Teachers use ABCmouse.com to supplement their classroom curriculum with highly engaging and educational activities that can be done with the class as a whole (using a digital projector or interactive whiteboard), with children working on computers individually or in small learning groups, or in a computer-lab setting. Tutors use ABCmouse.com to help them pinpoint and address the individual needs of children who have fallen behind or wish to get ahead. ABCmouse.com’s Lesson Builder function is especially useful in tutoring applications, since it allows the tutor to select learning activities with specific educational objectives for learning and practice in between tutoring sessions.